Almost 2 ac. 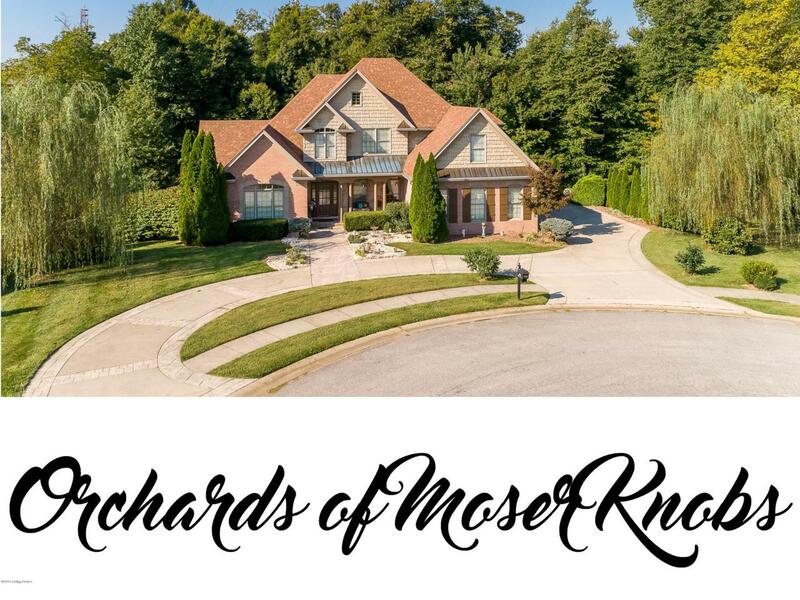 in Orchards of Moser Knob listed BELOW APPRAISAL! OPEN CONCEPT WITH 5 BEDROOMS, CHEFS KITCHEN, THEATER ROOM & PERFECT SETUP FOR SEPARATE LIVING QUARTERS! Circular driveway, custom stone w/ a covered front porch lead to a formal entry w/ 1st of many custom lighting pieces, OAK FLOORS; opens to living & dining rooms. Continue to the living room w/ gas fireplace, vaulted ceilings & windows overlooking a wooded back yard and a stream. Kitchen is a chefs dream w/ granite counters, detailed cabinets, a hand-pounded copper farmhouse sink, 2 ovens, a 9-ft center island, breakfast bar & leading to covered deck w/ gas fireplace. Lrg laundry room/Pantry is off the kitchen & comes complete with a laundry chute. Guest bath has been remodeled w/ a copper sink to mirror the Kitchen.1st floor Master Suite has detailed trey ceiling & private entry to veranda. UPDATED MASTER BATH boasts split vanities, jetted tub, steam shower & walk-in closet w/ built-ins. The 2nd floor boasts a second master suite (reading alcove/dbl walk-in closets/large bathroom) + 2 more bdrms w/ attached full baths. Basement is an entertainers dream w/a theater room, full 2nd kitchen, wet bar & room for all everyone w/ cards/billiards & anything else you can dream up! Dont forget another bedroom & full bath w/ access to hot tub area. Outside, find a custom concrete patio & a 3 car garage. Plus sellers are offering a Warranty w/ Water Softener coverage. Come see this beauty & make an offer!